After resigning the IAS in January 2001 in order to focus on creating a national liberal party for India, I made three attempts to create/join such a party between 2000 and end-2005. One major effort in this regard was the 5-day national conference on the future of Indian political liberalism I organised through India Policy Institute in January 2004. It was attended by all the big names in the field of India’s political liberalism: Gurcharan Das, Sharad Joshi, S.V Raju, Bibek Debroy, Parth Shah, Barun Mitra and even those who have been later on found out not to be liberals, such as JP of Loksatta (then an NGO) and Madhu Kishwar. Plus there were many lesser known people at that conference. After my second attempt (with Swatantra Bharat Party) did not go as expected, I started a further – third – attempt through the Liberal Party of India. Gurcharan Das joined as charter member, along with a few others. Unfortunately, LPI could not gain grassroots momentum and I therefore decided to wind it up. 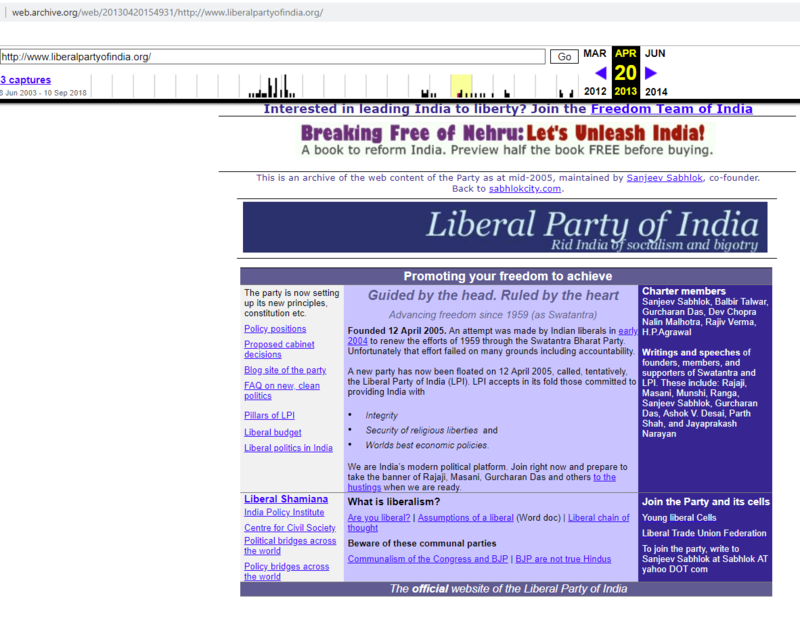 But – motivated by the strong initiative and commitment shown by Anil Sharma – I resumed working on the concept of an Indian national liberal party through the Freedom Team of India from December 2007. As a result of FTI’s efforts (FTI has now shrunk back to an association from being a Trust), the Swarna Bharat Party was created in June 2013. That this was more of an accident than by design is a side issue now. We have decided to take this forward and put in our best effort. SBP not only has the world-best manifesto, it is THE ONLY GENUINE LIBERAL PARTY OF INDIA. My articles – which were carried as centre-pieces in the Times of India – have announced this to the entire country in clear terms. Internationally, SBP is already recognised as India’s liberal party (e.g. Horasis India conference, 2017). This devious man purports to be interested in political liberalism but both he and his ideas are obnoxious and unsuitable for India. I’m writing this post today (1 April 2018) so anyone who thinks of joining him becomes adequately cautious, for they will be burnt by a dictatorial, illiterate and confused man who has NO CLUE about liberalism, personal integrity and team building. I have no time or inclination to discuss the many thousands of individuals who’ve connected with my work over the past 20 years and then turned out to be far less than what they said they were. But I make do an exception in a few cases, to illuminate the public record. This is one such occasion. This post is mainly about the highly questionable person by name of Anand Prasad, a lawyer. I received an email today from one alleged Liberal Party of India (screenshot here). 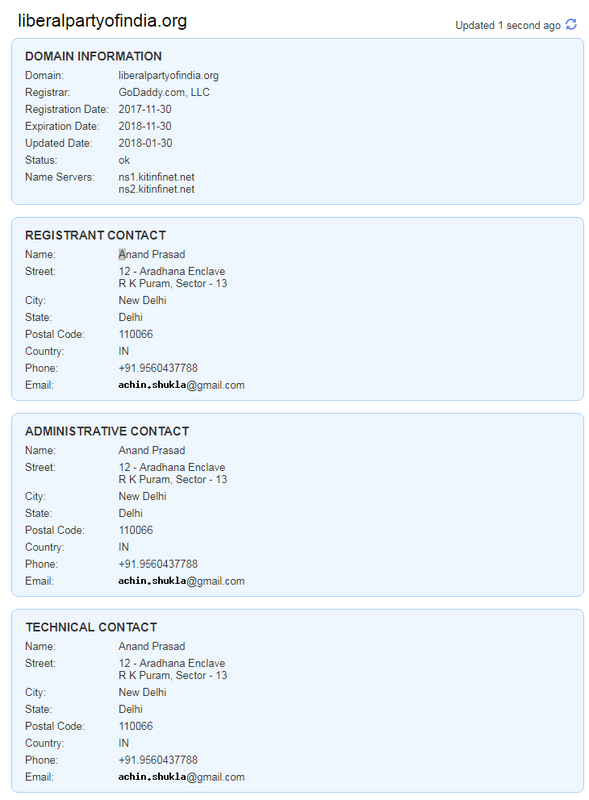 Anand Prasad owns the domain liberalpartyofindia.org – see screenshot taken today. (Btw, I owned this for 13 years but allowed it to lapse after we decided on SBP as the name of India’s liberal party. See archival records of this domain on archive.org e.g. see a screenshot here). It is essential to discuss the kind of leadership of this alleged “liberal” party, so no one in India is possibly confused and it is clear to all that SBP is the ONLY liberal party of India. Exactly one year ago, Anand Prasad showed a lot of interest in joining Swarna Bharat Party. I spent many hours on the phone with him, despite his tendency to ramble endlessly and not stick to the point. He also had some seriously flawed ideas and could only barely be called liberal. But I was happy to engage with him – I like to encourage everyone to become a liberal leader of India. He then sent me a document which contained his ideas. It was absurd and half-socialist. One of our party members reviewed it and wrote: “I would like to state that the document leaves a lot to be desired as a classical liberal document, as it has a lot of opinions and objectives that can only be best described as socialist.” Further, “These are all classic socialist mumbo jumbo.” This party member’s review of the Anand document here (in Word, tracked). I’m very kind to people, so I provided him with firm but polite feeedback (This is the link to my feedback (in Word, tracked). After this,I spent many hours again with Anand over the phone. He needed to agree broadly with the SBP’s manifesto before he would join the party. He also had to specifically point out where he disagreed. I recall discussing this and he soon said that he agreed entirely with our approach. ONLY THEN was he invited to join the party. But while he had agreed with the SBP manifesto, at a meeting of some people in Delhi, he again put forward his own manifesto – that too without incorporating the feedback we had already provided. Basically he had PRETENDED to agree with SBP’s manifesto. Almost immediately after his joining we had a regular Skype call among party members in which he was also present. At that meeting he suddenly raised the issue of the party name. I explained the long history of how the party name came about and said if he wished he could, within a week, provide a set of options that had been tested with the grassroots. It is amazingly difficult to change party names, but I was once again encouraging and agreed with his proposal to test alternative names. He said he would. There are many witnesses to that skype call, in which there was agreement that despite the great challenge involved in changing the party’s name, we would once again consider an alternative. We went over BACKWARDS to accommodate his concerns. Then, within a week of that call (and of joining), he resigned. AFTER HE RESIGNED he started calling all SBP leaders across the country over phone, asking them to resign from SBP and join him, instead. NO ONE LEFT SBP. Clearly, the entire time he spent engaging with me was a pretence, designed to better understand the party from within, and to find out all details of its key leaders. ANAND HAD BEEN CLEAR FROM THE BEGINNING THAT HE WOULD RUN A PARTY WHICH HAD HIS AGENDA AND WHICH HAD THE NAME HE WANTED TO GIVE IT. That’s not how we function on SBP. Everything is decided by vote. My preferred name since 2000 or so has been Liberal Party of India (and I even launched one in 2005 for a short while) but I have always deferred to the opinions of the team and this name was chosen after a number of voting processes. I would like to warn everyone therefore that they engage with Anand Prasad’s “Liberal Party of India” at their own risk. a) IT IS NOT A LIBERAL PARTY and has close to ZERO understanding of liberty or economics. b) IT IS RUN BY SOMEONE WHO’S WORD MEANS NOTHING. Note that even though the Liberal Democratic Party of Prodyut Bora is not a liberal party, I have no reason to provide any adverse comment about his party or about him. Prodyut’s character is impeccable. Out here, the situation is different. FINALLY, to anyone who has been misled by Anand Prasad, I say this: join SBP if you are a genuine liberal. We have a lot of work to do to liberate India. Don’t distract this work with fake parties.